Since more details are needed about how to add meta descriptions and keywords for each blogger page, I've written a new article on this topic. This is a continuation of the Meta Description for Each Blogger Page article and it's not meant to replace it. Please make sure you read the initial post carefully and follow all the instructions in it to avoid messing up your Blogger template. Our aim is to add meta descriptions and keywords for these sort of pages, so we should keep in mind the types of links mentioned above. Remember that what you identify as a post/article or as the homepage is identified by a web browser using the respective link. The first line expresses a condition: <b:if cond='data:blog.url == "http://_something.blogspot.com/2004/03/name.html"'> This basically says: "if the link (blog.url) that a user is viewing matches (==) a certain link (http://_something.blogspot.com/2004/03/name.html), do...". The second and third lines are the description and keywords themselves, placed in meta tags. An approximate translation for these two lines would be: "associate this description and these keywords with the current web page". The fourth and last line ( </b:if> ) ends the conditional statement. If the page that a user is viewing is the main page or a certain post or article, associate these respective keywords and description to it. That is exactly what we want to do and it is especially important since we can have a webcrawler (like the Googlebot) instead of a user. Unfortunately however, due to the fact that you can only declare a single "constant" link (http://_something.blogspot.com/2004/03/name.html) in this code batch, you have to repeat the sequence for your main page and for all your other post pages. You can place the keywords and description immediately above or below the <title>...</title> line - you choose. If your template looks different than mine, just look for the <title>...</title> line and make room for the code above or beneath it. If a user or webcrawler requests the http://_something.blogspot.com/2008/03/future-plans.html link (your second post page), the first, second and fourth conditions are not matched and the page they see will have only the meta description and keywords you specifically chose for it. I hope this clarifies the steps you need to follow. Please post your comments and feedback about this explanation. Thanks, Andrei! That makes it much clearer. So I'm right in thinking that if you have about 90 articles already published, and you folloow these instuctions, your template will be very long, as it will contain 90 sets of different meta tags...? Does this affect the website load speed at all? Thanks for taking the time to post this, it was much appreciated. Again, these tags appear using both the "View Source" option and the meta analyser site. Please give me some examples of links from your site for which you added the code and also the code itself you wrote - maybe I wasn't looking at the right pages. As you can see, these two are different, which means the meta analyser site shows correct data and the code works. About your first question, you can add (theoretically) 90 sequences of code for your articles. The current description and keywords of your site have 147+420 characters. We can round that up to 600 characters. Each character is stored on one byte in the ANSI encoding, so the whole batch will have roughly 600 bytes. 90 times 600 is 54000. A KiloByte has 1024 bytes, which means those 54000 bytes are equal to 54000/1024 = 52,73 KiloBytes (KB). That's approximately 53KB and your "michael thomas liverpool bursting" page has 96KB. You can have even larger pages loading very fast, so 90 sequences of (rather long) meta descriptions won't make a big difference. However, the code you need to add (those <b:if cond...> tags) are executed server-side. This means the server interprets them first and only sends out the meta tags for the only true condition. A visitor will therefore be receiving one web page plus 600 bytes of added meta content. Moreover, if I were you, I wouldn't bother writing descriptions for the articles you've already posted. I'd chose 10 important ones and write descriptions for those and then add new meta content for the articles I'd write from there on. I'm looking forward to your reply and I hope this explains the load speed issue. I tried the meta-tag analyser and the tags show up fine on the two articles. They don't seem to be working on the homepage though. When I check using http://www.scrubtheweb.com/cgi-bin/webtools/meta-check.cgi, it tells me that the tags are not working properly. Why do Blogger make things so difficult! What makes it worse is Google owns blogger yet makes SEO rdiculously difficult. Hi again Andrei - my website disappeared a few hours after inserting the code! I kept getting 404 errors, so I uoloaded the old template and it came back again. I emailed you the template with your code that I inserted. if you get time, have a look...tell me what you think went wrong. Only if you have time of course. thanks!!! When Error 404 appeared, i thought i've messed up everything, but recover with backup template and applied the codes, and the meta tags live! An excellent article that has been very helpful and I hope to implement soon. Would you mind just clarifying one thing please Andrei ? If I use this approach and I only add meta descriptions for say 10 pages, what happens with the remaining pages ? Do they then not have a meta description at all or do they default to the "home" page meta tags ? I have one further small question. Do I have to use the blog post title (finishing .html) or can a use a folder name, ie a search label such as :- "http://battlereporter.blogspot.com/search/label/-%20Dwarfs" ? If I can use the search label will all of the posts under that label have the same meta keywords and description ? Thannks very much for your post, people like yourself in the blogging community are a huge help for beginners like me. By default Blogger blogs don't have meta descriptions for their post pages. So if you only add the code for 10 pages, those 10 pages will have these meta tags and the remaining others won't have descriptions at all. You can use the code to add meta descriptions for a certan label such as http://andreiaga.blogspot.com/search/label/Blogger (this is an example from my blog). However, the description will only apply to the index page that contains all the posts marked with that label and it won't apply to the individual post pages. In other words, let's say you have "Article 1", "Article 2" and "Article 3", all marked with a label called "Articles". When a user clicks the link for this label, he'll get a page with three articles on it and this page will have the meta description you want. However, if the user clicks the link to "Article 1" (for example), the post page that appears will not have a meta description. The code is indeed less than perfect and you made a good point with these questions. I am however working on a more elaborate version of this hack and I'll post more instructions soon. Thank's for your comments and please let me know how this works out. Thank you kindly for the reply Andrei. You have been exceptionaly helpful to both me and, I see, the previous posters. You have given me some ideas. I need to see if any particular labels are picked up by google more often than others. If so, I might just apply the different meta tag logic to those pages. Or I might just select say 10 of the best posts and have different descriptions for those, like to suggested to a previous poster. I tried to use the wildcard on a test blog and I'm afraid it doesn't work. In the "head" section of your template you can only use globally available data and data tags for labels are only available locally (they can only be used within the "post" section or in certain widgets). There is a workaround you can use and it implies creating a widget within the "head" section. However, it doesn't quite achieve the result you're after and moreover, it messes up the "Page Elements" section in Blogger's Layout tab. Thanks so much for all your work, Andrei! I was able to get this to work on my regular blogger hosted blog, but I also have a blog which is hosted on a custom domain through blogger. Could you please explain how the code would be changed for this situition? Blogger blogs may use the old classic templates or new templates with layouts. If your other blog has a classic template, you won't be able to use the meta description hack on it (at least I never tried it and I'm pretty sure it doesn't work). However, if the blog has a new template (with layouts) you simply have to implement the code the same way you'd do for a regular blog. The only difference is that while blogs hosted on BlogSpot have permalinks that start with "http://_something.blogspot.com", those hosted on a custom domain have permalinks that just start with "http://_something.com". In other words, they'll have domain URLs instead of subdomain URLs. Now, from what I know blogs published on an external server (usually via FTP) have to use classic templates. However, from what you said I'm not sure if your blog is published on such an external sever or it's still on a BlogSpot server and just has a custom URL. If the latter is true, it's most likely that your blog uses a new template and you can implement the hack by simply following the instructions above (no special changes are needed). Let me know if I undertood the question corectly and if this answers it. I'm not sure how blogger hosts a custom domain through them or whether or not I am using a classic template. I tried your instructions on a regular blog and had no problems, but when I tried to change the html on the custom domain it would not work. since my custom domain is http://_something.com. Have I explained my situation any clearer? Hmm... let's do this: you tell me the link to your blog and I'll create custom meta descriptions for two or three of your post pages. If that doesn't work on your other blog, it will mean that it's using a classic template and this hack is simply incompatible. If, for any reason, you don't want to post your blog URL in a comment on this blog, please mail me at andrei_aga [at] yahoo.co.uk. Thanks Andrei for all your work. I was wondering if someone could make a widget, gadget or macro that would make it easy to make this code each time and would tell you in real time keyword density and character length....then after you hit submit it spits the proper code out highlighted and ready to paste. I could maybe experiment with imacros but don;t know the first thing about making widgets or gadgets. RE: Title swap. Is it better to use the code that removes the Blog title on all pages except the main page? This way you don't have the duplication factor within each post title depending upon the length of the post title. your posts is very helpful however i have onde doubt. IF in the forntpage(main page) we have meta content, it's possible to had metatags for subpages? It won't override or cause instability? http://smallworkarounds.blogspot.com.I am using a template in there.I have wasted my time and written exactly the same way for each of my 42 posts but to my surprise when i inserted them to my template its changing doble quotes just after the ==in cond to " i think this is causing problem please see my blog and do help me and tell me if i am doing something wrong. Here i have pasted what i have made please do reply soon. This i have pasted just above the title and nothing is getting downloaded when i do view source only the meta tags which google webmaster and some other sites have injected to test the originality are getting downloaded. Try using the code in this text file. It's basically the same as yours, except that I replaced the double quotes with corresponding HTML entities. Since this code is in a plain text file, you shouldn't have any problems with it. Please let me know if it works or if you need more help. Thanks Anderi for your quick reply i have already tried that rather i should tell you that if your write double quotes in blogger edit template it automatically converts it to " but with this nothing is coming on pages metatag content you can check my blogs meta tags.There are already a few coming by default are they causing the problem.I dont know why my meta tags are not being displayed using your code snippet although it seems that i am doing everything correct.It would be very nice of you If you could please look into the matter. Hello Andrei Sorry to bother you again but i dont know how,but now my meta tags are working.I haven't done anything special now just replaced "" with their html counterparts which i was doing a day before also but it was not working but surely today its working.Thanks for all your help man you rock.Keep the good work going.If i have a doubt again i will again bother you.You are really doing a good job. Thanks for the comments and don't hesitate to contact me if there's anything you want to discuss. Hi Andrei- I put the code with my own keyword/blog url & description, but its giving me xml parsing error.. What should I do now? I copied the code from this blog & paste it onto notepad to make sure its done right. But so far it keeps giving me the same error. Try using the code in this file: http://andrei.agavriloaiei.googlepages.com/code.txt. It also contains a hack for switching post titles with blog titles for post pages - if you don't need that, simply erase the first condition. Thanks for your timely help. However I got the same xml parsing error, even after implementing the text code. Can I email you the code that I have pasted? So you cancheck for any errors.. I truly appreciate your help with this problem. Yes, please do. Also, could you copy/paste or make a screenshot of the exact error message for me? Hope you are doing well. I have sent you an email with the exact error message & also the code that pertains to my main blog url & post url. You are awesome! It worked perfectly after your coding suggestion. You are nothing less than a genius. Thank you very much & I look forward to read more posts from you. thank u so much Andrei.... i followed your instruction and working fine for me.... i'm still observing the results. cause 2 post indexed in google in 2 different way after this. in the first one google took the description form the meta tag, but in the second it didn't. implementing the solution was a bit annoying cause i had to write 90 meta tags for my 90 posts. but i did it. one last thing... as google have already indexed my older pages with the older static meta tag generating duplicate description, is there any way to reindex them all? Wow! 90 posts... I'm sorry you had to go through that :( Make sure you get back to check out a faster method I'm working on. It'll probably be ready in a week or two. About your question: you could try a service like "pingomatic.com". However, tools like these only notify Google that your blog has changed. I don't know any methods to "persuade" search engines to reindex your pages. They will reindex them in time and you just have to be patient. oh... that's great news that u r working on a faster method. i'll love to try that also. about the reindex, the google seems to be very reluctant to do that. In order to show you the most relevant results, we have omitted some entries very similar to the 93 already displayed. how can i get rid of this line?? can u suggest anything?? hi Andrei, here's an update... i forgot to add the meta for my latest post before google crawled. but google indexed the page with the first para of the post as the description. i would have also used the first para as meta description as i did for early posts. so.. what's the point in adding the meta tag?? i think i should only use the meta 'if condition' for the homepage meta... and leave the rests.. google will automatically index it with the first para as description. what do say?? btw... a good news is.. my site is being crawled atleast once in every 24 hrs. i think that's a very good crawl rate for a new site. Please find an answer to your questions in my reply email. The one thing I need to mention here is that the code for the homepage has to use the "data:blog.homepageUrl" datum instead of the actual URL. I'll fix this issue or explain more in my next article on this topic. How are things going? Hope all is well. I know you've helped me in the past about my meta tags for one of my other blogs I have. I was wondering if you could check my source code for one blog I recently changed to see if I did it right. I changed it and published a new post for changes to take effect but it is still showing my blog title in Search Results rather then the blog post in which I like. I followed the directions you gave me in the past but doesn't seem to be working in my latest post I made. Please look at my source code and let me know if all is right. All your post pages use the post title as page title, so everything appears to be working fine. I did a "site:www.yourguidetointernetmarketing.net" query on Google to look at how your pages were indexed and although most of them are still indexed with the blog title first, there's one post (How To Increase Blog Traffic) indexed with its own title. I think there was one more yesterday - the one called "Blogs may not be hosted at naked domains" - but today I can't see it in the index any more. Don't worry about that, it will probably be included again shortly. The conclusion is that you've applied the hack correctly and Google has already indexed some of your pages as you want them. So it won't take long before all your pages will show up with the article title. Thanks for checking into it! I noticed that the other day too that they are starting to appear in the search engines as the Post Title. Glad to see! Thanks for taking the time on checking to see if I applied the hack correctly. Much apreciated. 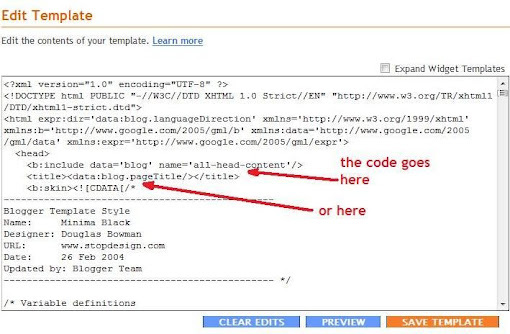 Great job on the new tool you've create so people can get the code for meta tags and title tags from your blog. People will love that. Thank you very much to give us such great video tutorial. It is very helpful to customize meta description and keyword in blogspot.But Till now I don't have the benefit of customizing meta description and keyword for each post page.Now help me please what should I do? Oh yes ,in Thursday, February 12, 2009 video tutorial at the end you said that in next you will show how to snippet the link ,search engine bot that is helpful for us. 1. Select the value "1" at Step 1. 2. Select "No" at Step 2 and 3. 4. Fill in the other two fields with your description and keywords. 5. Click "Get the code" and place the generated code into the HTML source of your blog, over the commented line specified the the tutorial. Good luck and let me know if you need more help. hi, dude i am just want to know that i have changed my blog address today not own domain name but blogpspot to blogspot and i want to know whether i need to verify my blog again and submit to google search engine.. I really want to know how you got rid of blogspot at the end of your address. So this means that the meta data added for a post page will include (when read by the crawler) the meta tags for the main page as well as the post page whereas a post page with no additional meta tags will only read the main page meta data? Not really... that's not quite what it means. Go ahead and watch this video. It should explain things better. For some reason when i open the view source code, the main index page, it did not show up at all, but the second page it works fine... I dont know why it did not work for me but for others here it seems working fine. So what I did I change the code instead of using URL page, I used the page title. Now it seems it is working fine. I am a beginner, please give me some advices what else need to be tweak for SEO part. Thanks. This article was deeply informative; for the longest time I had visited other SEO-oriented blogs to try and get separate meta tags rendered correctly for each of my Blogger Pages. The spiders "refused" to crawl my site appropriately. Finally I stumbled on what I was doing wrong by seeing your instructions; I was using PageType instead of Homepag.url. Long time no see! Howz life? Hope you are in best of health. I was wondering if it is possible to link or 'call' a text file with all meta tags code inside it. The file can be hosted somewhere other than blogger (third party like fileave,dropbox etc) since we are not allowed to host any files on blogger. When I say link or Call, I am referring to .js or jquery files (externally hosted) that are called up through a text/java script. Can we duplicate this process to call up meta tags code file... This way the blogger template is not bloated with excessive code. If someone has more than 100 posts, then all the meta tags code will eat up a lot of space within the template of blogger. Do you think the above idea is possible at all? Your comment is indeed a pleasant surprise. I'm really glad we got back in touch and I hope to hear more from you soon. Really glad to hear back from you. I do hope we can re-connect again & share some insights. I love how you have redesigned your site by providing helpful & intelligent content. Best of my wishes to you. Thanks Andrei. Highly appreciate your detailed post on meta description for individual posts. I can now finally update my site.